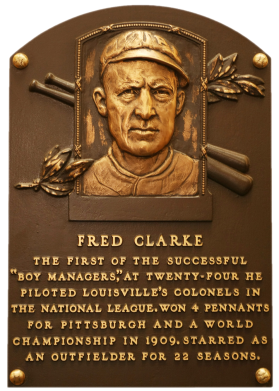 For 19 of his 21 big league seasons, Clarke was a manager as well as a player, all for the NL Louisville-Pittsburgh franchise. As a player, he hit .312 with 2,675 base hits and 1,621 runs scored. As manager he won on World Series in 1910, four pennants, including three in a row from 1901-1903, and finished second five times. "Cap" finished his managerial career with 1,602 wins against 1,181 losses. Comments: The first Fred Clarke portrait I picked up was a 1911 T205 PSA 5 in March, 2002. In January, 2003 I replaced the card with a PSA 3 1906 Fan Craze card. In June, 2005 I upgraded to a PSA 8 from Bud Ackerman. Around this time I decided to take the collection in a different direction and pickup new type cards. I didn't have any 1910 D322 Tip Top cards and purchased one in Poor condition (raw) in September, 2006, which subsequently graded SGC 10. It was upgraded to a SGC 40 example in July, 2008 with a last minute eBay snipe from seller Cardboard Classics. I really want to pickup a D322 Barney Dreyfuss card at some point and figured this was a good opportunity to add a new type card. 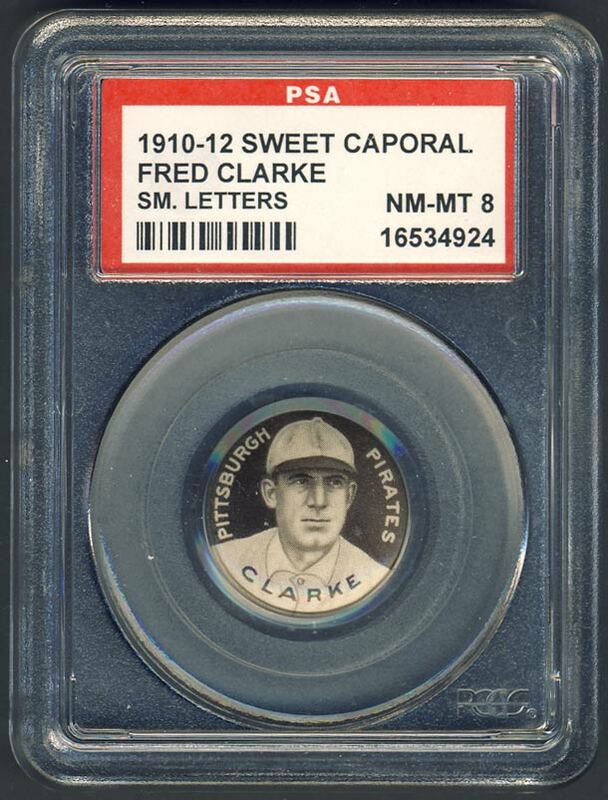 So, I purchased this 1910-12 P2 Sweet Caporal pin from Legacy Sports Rarities in June, 2010 via eBay to replace the D322. I ended up trading the SGC 40 Tip Top Clarke, with a '36 WWG Foxx to pickup my N173 Anson SGC 20. 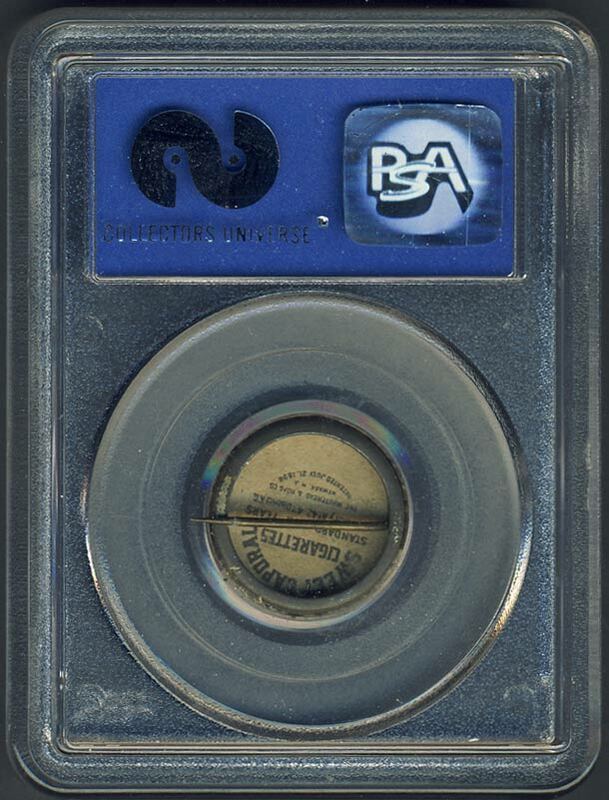 Description: Expanding its premiums to include more than just trading cards, the American Tobacco Co. issued a series of baseball pins circa 1910 to 1912. The sepia-colored pins measure 7/8" in diameter. The set includes 152 different players, but because "large letter" and "small letter" variations, collectors generally consider the set complete at 205 different pins. Fifty of the players are pictured on a second pin that usually displays the same photo but has the player's name and team designation printed in larger letters. Three players (Bresnahan, Mullin, and Wallace) have three pins each. It is now generally accepted that there are 153 pins with "small letters" and another 52 "large letter" variations in a complete set. Research among advanced collectors has shown that 19 of the pins, including six of the "large letter' variations, are considered more difficult to find. The back of each pin has a variously colored paper insert advertising Sweet Caporal Cigarettes. The red backings are generally less common. The Swee Caporal pins are closely related to the popular T205 Gold Border tobacco cards, also issued by the American Tobacco Co. about the same time. All but nine of the players featured in the pin set were also pictured on T205 cards, and in nearly all cases the photos are identical. The Sweet Caporal pins are designated as P2 in the American Card Catalog.